Sometimes I can't really decide whether something I've made is too simple to count as a real recipe. For example, the side dishes I cook for normal dinners are often just sauteed or roasted veggies with some salt and pepper, and the breakfast I eat most days is yogurt with fruit and granola. In my opinion, even though dishes like those are consumed often in my house, they aren't really worth blogging about. So when does a dish cross the line and become interesting enough to tell people about? I don't think there's a single right answer to this that applies to every blog - it really depends on the style of the blog and the target audience. I'm personally still trying to figure out my thoughts on this question and would love to hear your opinions! I was originally unsure whether this carrot dish was blog-worthy. Carrots and thyme is not an original flavor combination, but it is a pairing that I honestly think is transcendent. There's something about thyme that elevates roasted carrots to a whole new level. The dish would be pretty good without the browned butter, but the butter makes it a bit more special, worthy of serving at a holiday dinner. So once I thought about how much I like this simple side dish, it seemed clear that I should share it with you and my decision was made! Preheat oven to 425 deg F. Toss carrots with oil and sprinkle with salt and freshly ground black pepper. Spread carrots on a large baking sheet and roast in preheated oven until tender and browned in spots, about 30-35 minutes total, tossing once or twice during roasting. Remove carrots from oven. In a small saucepan, melt butter over medium heat, stirring frequently, until foam has mostly subsided and butter is a warm brown color (you will see some specks of solids at the bottom of the pan). Immediately pour butter over carrots. Add thyme leaves and toss well. Season to taste with salt and serve. love roasted carrots with coconut oil, but now i'm going to have to try browned butter!! I like seeing simple side dish posts. I wonder about that sometimes, too - but these carrots look yummy! I love side dish recipes. Sometimes I get so focused on the main dish when I'm cooking that I can't figure out what to make with it. These carrots look delicious! I'm always a fan of posting the simple recipes that I cook all the time - I find that's the way most people are actually wanting to cook! This is most definitely worthy of a post. Looks delicious! Browned butter &thyme, what a fabulous combo. I used to not like cooked carrots, something about the mushy-ness combined with its sweetness. I like it now though:) I bet the thyme adds a wonderful flavor too!! 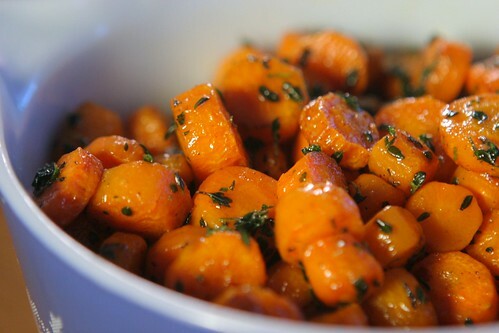 I never think to do much with carrots but eat them plain- I love this diea! I always wonder about this as well, but I've come to realize that if you love it, you should post it...because chances are someone out there won't have thought of it but will love it as well! This sounds majorly delicious to me! I've actually never tried the carrot/thyme combo! wow. Looks so delicious. I would definitely do this recipe later this week and let my husband and I discover another healthy treat. Though, I might use coconut oil rather than canola oil.